Learning Front-end development is never too… early! Especially if you are a student of 8-11 grades and are actively interested in technologies. Therefore we at BIONIC School came up with a special program for pupils and summoned them to learn how to create their own projects and become IT-gurus! One of the best ways to get to know someone is through social networks! 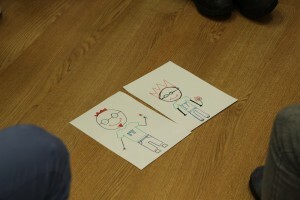 That is why the participants were divided in pairs, and each pair invented their own “fairy-tale” profile: painted their portraits and told about themselves. After a few more fun games – “Fruit Salad”, ‘Human Knot”, “Ikea game” – our high school students, who didn’t know anything about each other just yesterday, became almost friends only in an hour. The exercises for development of the team spirit taught the participants to find agreement with each other, to make right choices … and not to store four cucumbers in an empty room! And then a Man wearing a crown appeared. But first the participants had to work hard. They were divided into three teams. The first team saw a picture of the Man, the second listened attentively and described the image to the third team which had to draw it. The portraits looked very alike! In general, the start of BIONIC Winter Camp was very eventful and vivid. After active games our students headed to have a small coffee break and fresh pizza! What could be better on a cold winter day? But what was the surprise of BIONIC team when instead of eating candies, camp participants started … building candy-towers! After the candies they took upon plastic cups, pizza boxes and everything at hand. Young architects enjoyed it so much that they even made a small competition with each other: whose tower will be higher. And then came the long-awaited moment: the participants went to their first class with the trainer. Each chose an iMac and the group started studying! For the upcoming five weeks they will learn to create their own Internet projects, get to know a lot about development and will become cool IT-gurus!